Reflow is a musical notation software that can be used to create your own original scores in a very flexible and innovative way. Songs you write can be played back using the embedded software synthesizer. Reflow can also import and play any Guitar Pro* or PowerTab file you can find on the Internet, giving you access to literally hundred of thousands of songs to learn and practice. Reflow integrates well with the latest Mac OSX features, with its support for iCloud, Autosave, Versions and Full Screen Mode. Then you can take away and modify your compositions anywhere you go using the Reflow for iPad App. With its iCloud support, every change you make in a session with your band, will be waiting for you when you come back home. - macOS Versions and Autosave. 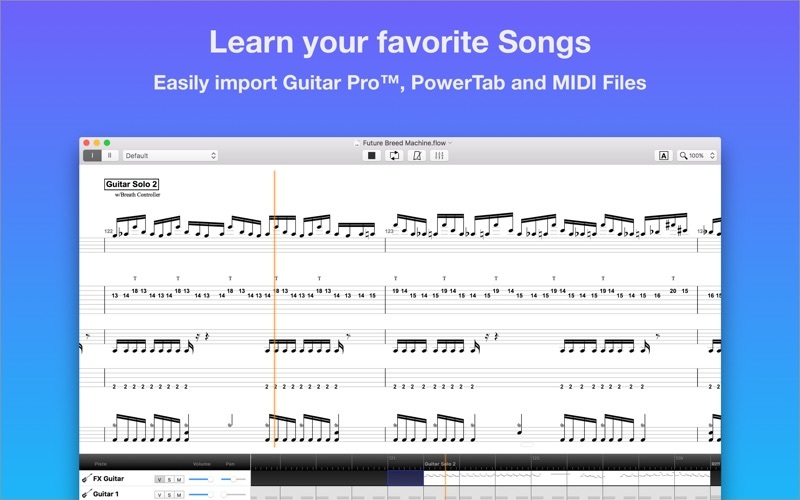 - Import and playback any Guitar Pro*, or PowerTab file. - Works seamlessly with Reflow for iOS. - Enter notes using your MIDI keyboard. - Export to MIDI, GP5 or WAVE file for easy sharing. 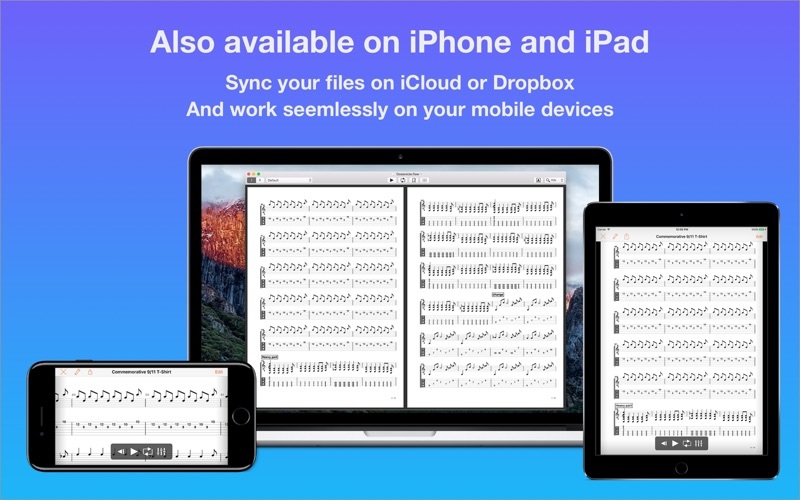 - Keep your songs organized using the built-in file library. 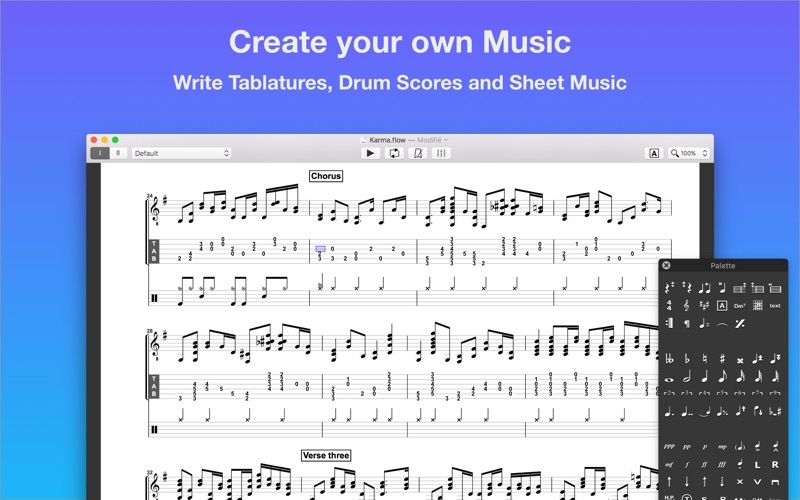 - Write your music using Tablature, Standard notation, Chord Diagrams and Chord Names. - Support of Piano Grand Staff. - Musical directions (Coda, Segno, …). - Flexible design allowing you to use different scores for each instrument of your song. - Manipulate your song's sections painlessly using drag and drop. - Chord diagrams database you can drag onto your scores. 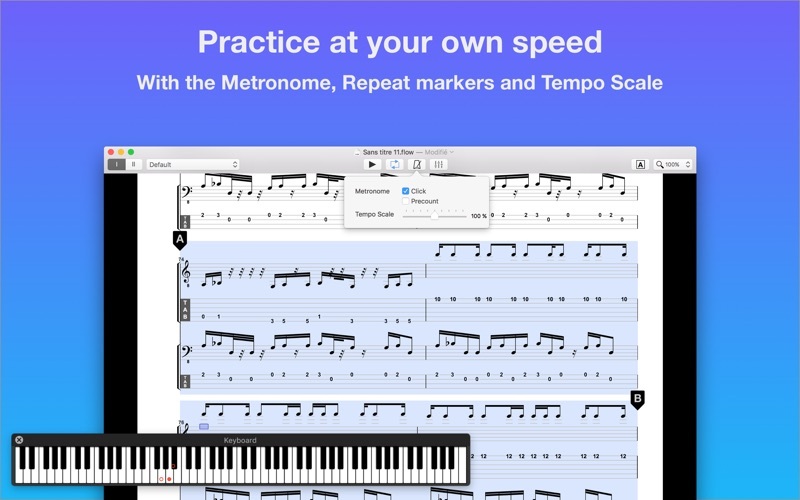 - Display the notes on a Fretboard or Piano keyboard. - Full vector graphics PDF export for easy manipulation in Illustrator. - Many Guitar effects and articulations, such as Bend, Brush, Slides and much more. 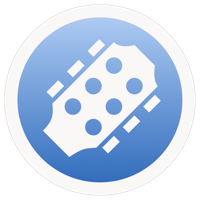 * Up to Guitar Pro 5.x version.